Liz Revit Jewelry Designs - From Metal to Mixed Media And Everything in Between! If you're looking for innovative jewelry designs, look no further. From metal to mixed media and everything in between, Liz has a style to fit your design needs. Liz Revit's Recycle With Style™ Jewelry Line Is a Smashing Success! What began with a variety of discarded items ranging from lock washers, aluminum pull tabs, paper clips, nuts and bolts, and food package containers along with some ingenuity, Liz's Recycle With Style™ jewelry line has proven to be a best-selling line for her retail partners. Nothing is off limits when it comes to designing jewelry for her Recycle With Style™ jewelry line. 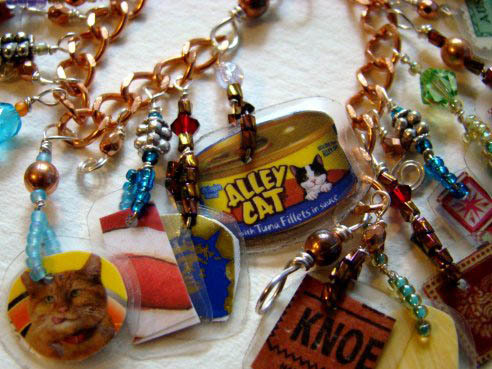 If you look closely, you'll see a Knoebel's Amusement Park arcade ticket and some cat food packaging on this lovely charm bracelet, which was featured in Simply Beads. These design samples will give you an idea of Liz's versatility as a jewelry designer. Simply click on the images to view. Liz began designing jewelry at a young age, and in third grade, she started selling jewelry to her friends at school. After graduating from college and landing a corporate job, Liz looked for a creative outlet and started to sculpt beads using polymer clay. In 1990, Liz studied metalsmithing with Gary Grossman and then with Norah Masseti. Liz mastered soldering and surface design methods, such as etching, piercing, hammering, reticulation, granulation, copper plating, and antiquing metal. She studied lost-wax casting with Sister Regina Kiehl and learned how to create epoxy resin jewelry after taking one of Susan Sloan's workshops at Peter's Valley Craft Center in 1992. Over the years, Liz learned the art of bead weaving and designed many of her own patterns that she sells online. She also taught herself bead embroidery. 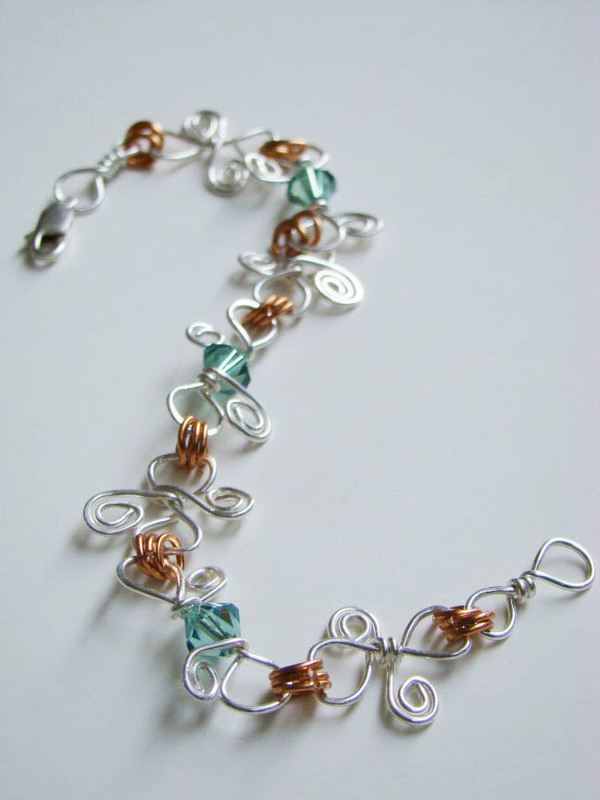 Liz currently uses a lot of recycled materials and mixed-media in her jewelry designs.